to take the valance down. but the treatment seemed way too heavy and it was also hung low which made the wall look shorter. costly for this large wall of windows so I am taking my time and looking at options. The last thing I want to do is make a very expensive mistake. 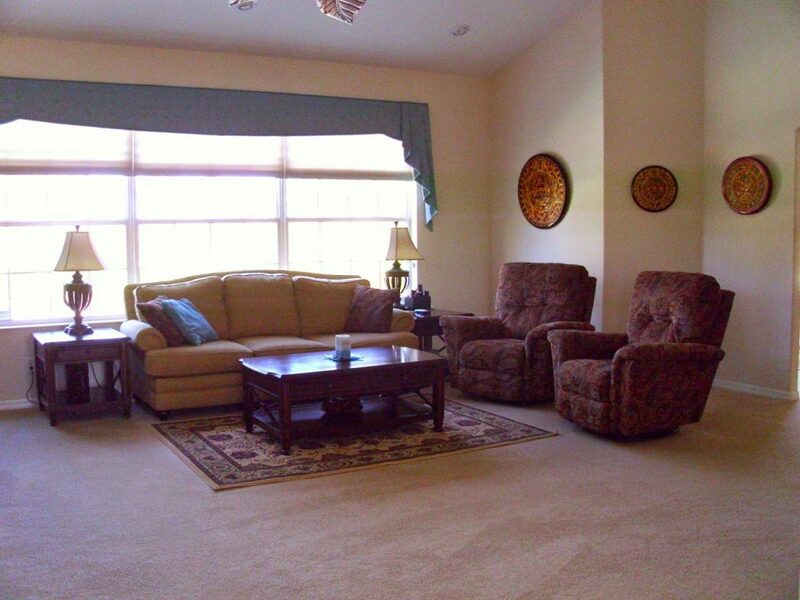 Below is picture from the MLS with Big Bertha and the previous owners furnishings. I’ll be back soon to show you a couple of new purchases and a project in the works. Oh yeah, Bertha didn't do that wall of windows justice at all, Sherry! It looks better already with it down. It is great that you have shades for privacy. You could do something light and white from Ikea for the summer months. Also, I've seen some great looking tablecloths used as window treatments with clip rings. Adios Big Bertha! Love your chairs and table! Big Bertha….we had a vacation house with a big Bertha. It came down!!! 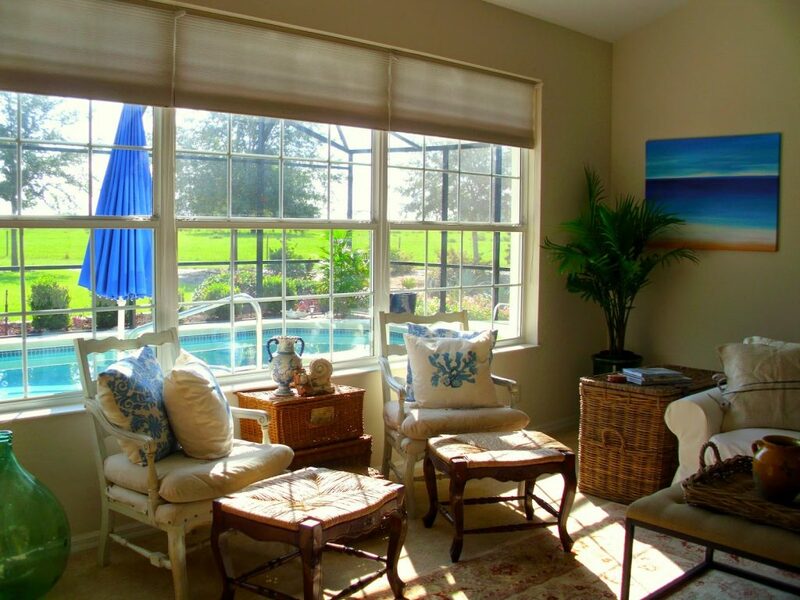 As for window treatments and expensive mistakes….I understand that too. I have a couple of windows that are still puzzling me at present, but hope to figure it out. 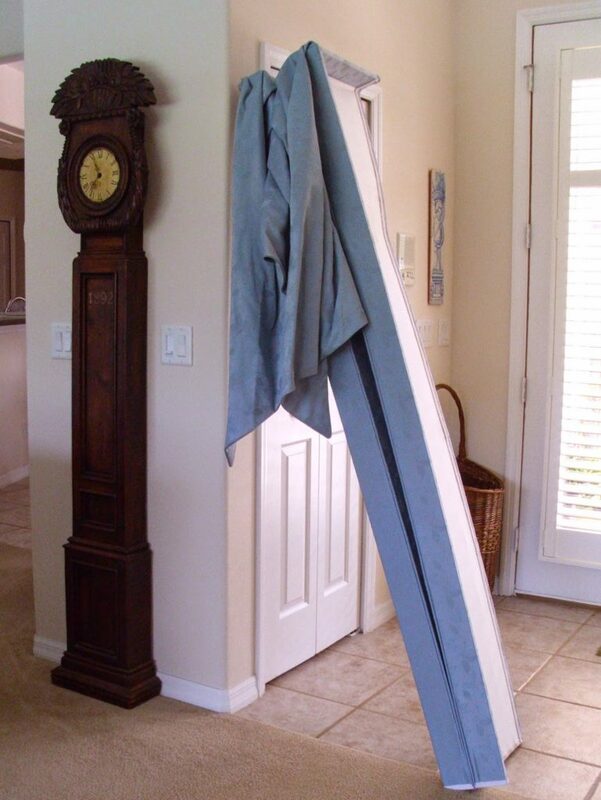 I am remaking a few expensive window treatments for our new house…a couple of them just will not work! Can't wait to see your projects. Bertha did indeed need to go! Love the blue and white I am seeing, so pretty! So much better Sherry!! Can't wait to see what you decide on…I know it will be beautiful! What a difference you've made already! And taking that thing down was beyond a doubt the right thing to do. I have to say that curtains have been the bane of my existence for as long as I can remember, no matter what house we lived in. I end up getting very confused as there are so many options! 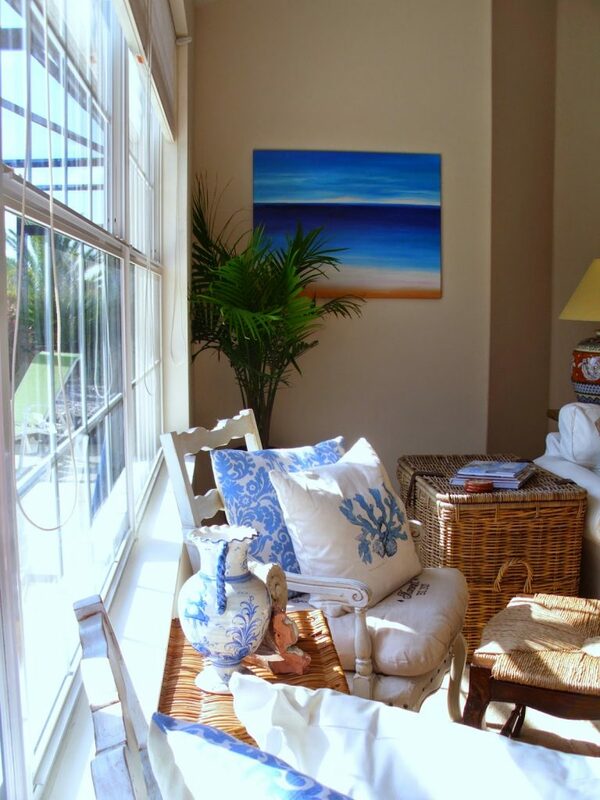 That's why I love plantation shutters, they're simple and classic. I know you'll find the right curtains. Good Luck! So glad that Big Bertha has left the house. Your room looks so pretty with your colors than the previous owners. Good luck on your new drapes. The pool looks good. I found great curtains at ikea…linen and long enough for my tall windows…I did add lining to the back to make them hang nicer and look a little more expensive. I'm sure your home will be beautiful once you have all of your great things in place. Yep, Big Bertha must go! Your windows look so much better, even without new treatments. Looking forward to seeing what you come up with. I love the clip-rings and find it easy to change curtains seasonally. What is a challenge is balancing on the arms and back of my grandma's couch while I take curtains down or put them up!! Sheets and drop cloths are good for a casual airy look at low cost. Have fun imagining the possibilities! That is too funny that you named it! I would have to agree with you that Big Bertha needed to go too. You are so funny Sherry! It is amazing how open everything feels now with BB gone. Thanx for partying! You are so right, Bertha had to go! The room looks so much lighter and more welcoming. It's so going to be gorgeous, can't wait to see what you chose! I like the simple shades they frame the garden view and create more of a sense of space. I most definitely couldn't have lived with the blue valence for long. I never understood why curtains seem to always convey with the sale of a property??? We don't leave our pictures which are usually just as taste specific. I can't wait to see what you do with your large window. Yes…I think it was time for her to go! What a beautiful view you have with all those windows.